The average rate of regular teen marijuana use in the legalized states of Alaska, Colorado, Oregon, and Washington is 30% higher than the U.S. rate as a whole, according to new data from the National Survey on Drug Use and Health. Almost a third of all 18 to 25 year olds in legal states used marijuana in the past month, up from around one-fifth ten years ago. New data released last week show Colorado as the top state in the Nation for first time marijuana users, and its rate of first time users has more than doubled in the last decade. In that state, use among people 18 and over has also skyrocketed, as well as use among young adults. Use among 12-17 year olds is slightly higher than 10 years ago (though lower versus last year). 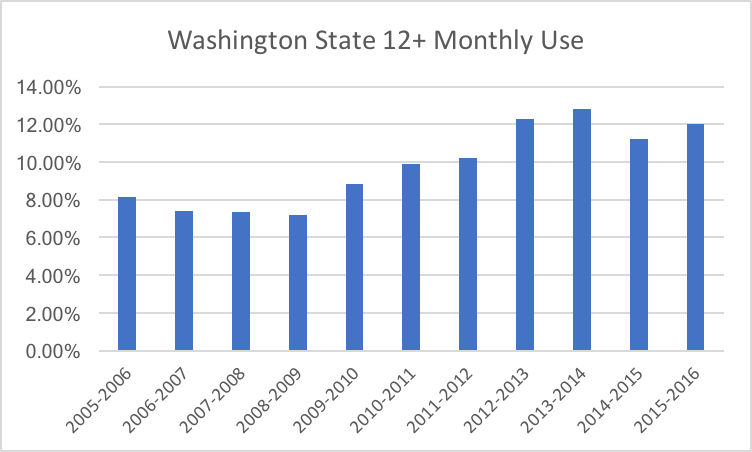 Monthly use has also gone up in Washington by 10% since last year, and in virtually all legal marijuana states since before legalization, among household residents 12 and older. Of particular concern was the fact that the use rate among 18 to 25 year olds has increased across the board. 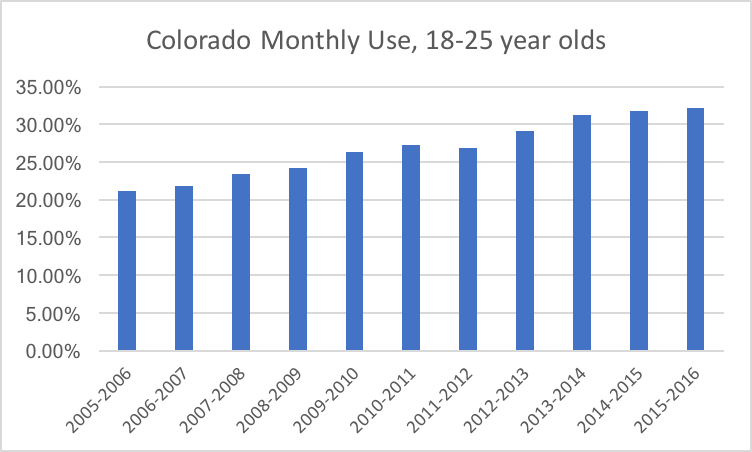 In Colorado, almost half of young adults used marijuana at least once in the past year, up from 37% in 2005. Washington DC’s number is 51%, up from 30% in 2005 – representing a more than 50% increase in users. In Oregon, use is up in this category more than 10% versus last year, and it is up 50% in the past ten years. 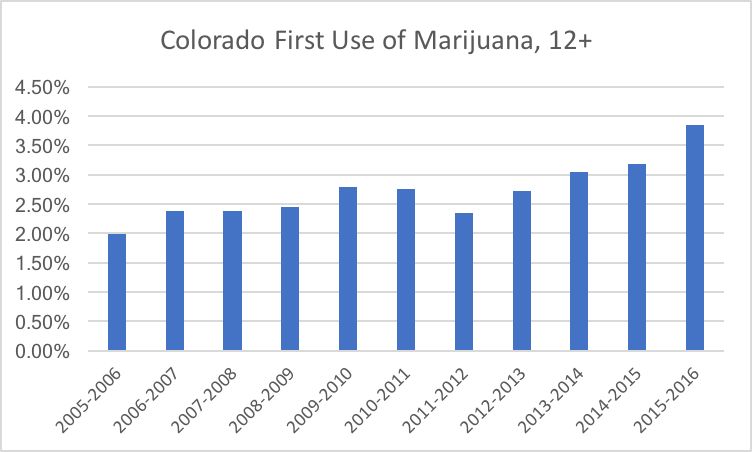 In Colorado, 7.6% of 12 to 17 year olds used marijuana in the past month in 2005-2006, compared to 9.1% currently. While that number is lower than in recent years, we do not know how many of these users are heavy users. National estimates have reported significant increases in the number of heavy marijuana users in the U.S. Medical marijuana became commercialized around 2009. 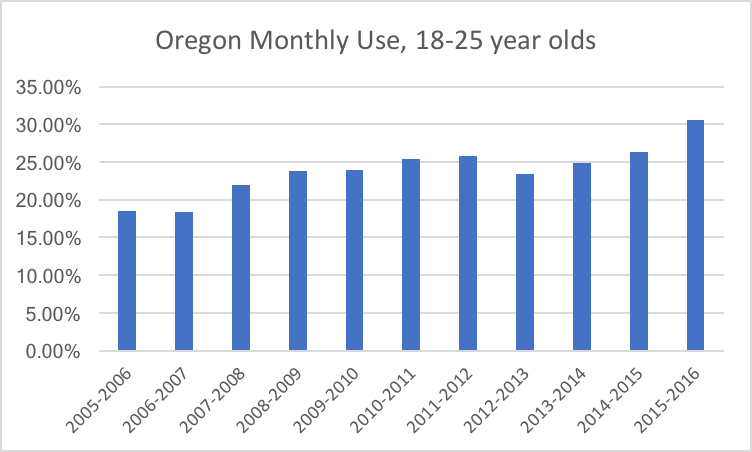 In Oregon, youth monthly use is up since last year, and in Washington it is up since 2008-2009. For adults, many of whom drive regularly and are in the U.S. workplace, marijuana use can be a public health and safety hazard. Adult monthly use has increased in Colorado and Oregon almost 40% since legalization, and yearly use has also increased across all legal states since laws have changed.